4. Drink throughout the day! You should drink all 60 oz per day every day for the 7 day period, which means you will need to remake it each day. The drink is a natural diuretic. 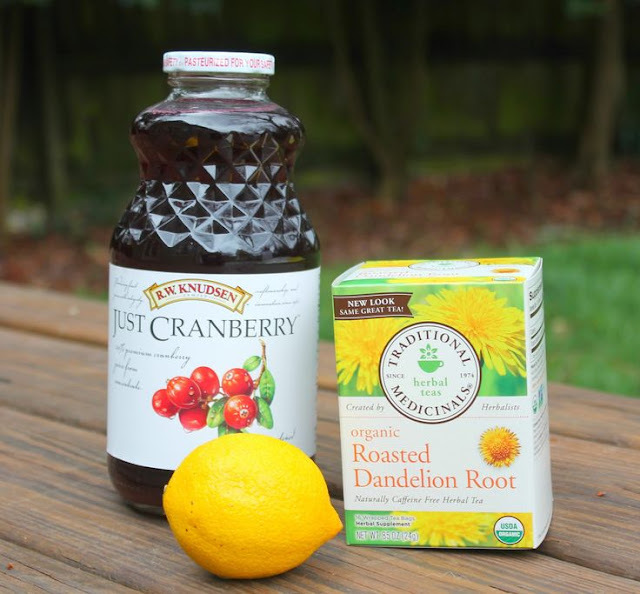 Each of these ingredients has many benefits, but this is how they relate to our current aim of detoxing the body: Dandelion aids in digestion and weight loss, cranberry is great for flushing out infection and is high in organic acids which emulsify fat, and lemon is an anti-bacterial and also aids in digestion. I snagged this recipe from Jillian Michaels. I have a feeling she doesn't carb-load on Thanksgiving like the rest of us plebians, but she suggests it to her clients who need a bit of detox or who want to kick-start weight loss. And have you seen her abs...? I have been drinking this for several days now and absolutely love it! As always, we never suggest something we haven't tried and loved. Hope y'all had a wonderful holiday! * Though individuals tend to estimate their holiday weight gain at around 3.5 pounds, studies show that the real number is closer to 1 pound. The risk of that extra weight is higher for those who are already obese. ** The original recipe calls for distilled water. Some people think distilled water is healthier to drink as part of a cleanse. I happen to not be one of those people. Distilled water isn't inherently unhealthy in small quantities, but water with minerals is healthy, so why miss out? I'm desperately trying to avoid a tangent about plastic bottles and BPA, estrogenic compounds, etc... but it is worth noting that distilled water does usually come in a large plastic jug. Take with a grain of salt. Not literally. Whatever. This is not to be confused with medical advice. Use common sense. Dandelion Root Tea is not always suitable for pregnant or breastfeeding women.